Welcome Warriors! - Radio Guest List.com - How to Get Radio Interviews and Find Podcast Guests! Thanks for checking out our special Warrior Forum offer for a free review copy of the "How to Get Radio Interviews" MP3 Training Course. I’d love to get your feedback on the course and its recommended PR strategies. If you download the course, will you please take just 1 minute to jump back to the Warrior Forum to post your comments after you check it out? I’d love to hear what you find valuable about the course, which tips you’ll be trying in your own marketing and PR efforts, and generally your impressions of the package and its radio interviewing strategy training. And, if you're interested in becoming an Affiliate for this product, check out our Click Bank offer and all the easy-to-use free affiliate promo tools here. p.s. Another great free publicity resource? 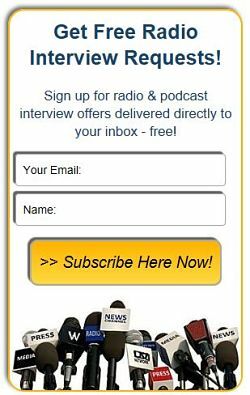 Join our free daily email list of radio and podcast interview opportunities here now!